Los Glaciares National Park is a national park in southern Argentina known for its glacial activity. It holds 47 larger active glaciers. The park is situated on the Southern Patagonian Ice Field, the largest ice cap in the world outside of Antarctica and Greenland. 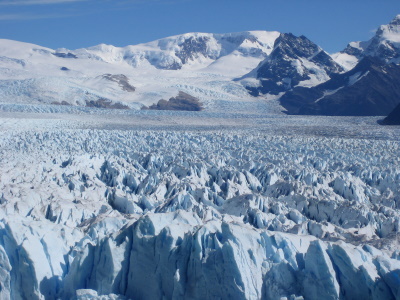 The biggest glacier in the park is the well-known Perito Moreno. The area is also shaped by two large lakes: Lake Argentino and Lake Viedma. But I think the highlight is the Perito Moreno Glacier - one of the most popular tourist stops in southern Patagonia. Busloads of people come in and out of the site every day and it’s one of the main reasons travellers bother to stop in the nearby town of El Calafate (although it is actually quite a nice place in its own right). In fact, the whole region seems to be going through a tourist boom at the moment and visitor numbers are definitely on the rise. Los Glaciares is a national park in the southern Andes in Argentina. As the name suggests there are plenty of glaciers to see and explore, the most famous one being Perito Moreno. The park is split into two parts: North and South. Our map doesn't quite convey this. The southern part is where you find the Perito Moreno glacier. It is serviced by the town of El Calafate that lies 1h drive outside of the park. The northern part holds the Fitzroy Mountain range and spots several great hiking opportunities. This part is serviced by El Chalten and both parts are a 3h drive on a nowadays good paved road apart. I agree with Solivigant that El Chalten and the northern part are more interesting. It’s not so much that the city is nicer per se; construction has picked up and I guess in a few years it will be equally touristy as El Calafate. But you are on the edge of the park and less dependent on a tour operator or bus. As such, I would do a one day visit from El Calafate to see Perito Moreno and then head to El Chalten the very evening or the next day. To me the park is one of the great national parks of the world, truly deserving of its inscription and worth travelling this far. El Calafate has an airport with connections to Buenos Aires, Bariloche and Ushuaia. Busses from both El Calafate and El Chalten north run along the Andes (the famous Ruta 40) or the coast via Rio Gallegos. From El Calafate you can also connect to Torres del Paine in Chile. There are daily shuttles between El Chalten, El Calafate and the airport. Be aware that distances in Patagonia are huge, especially taking the average speed into account, and that there are very few sites and cities in between. If you look at the map and don’t see any town for 100km, then there isn’t any. And even the “towns” you find may be tiny. Finally, gravel is still widely used for the roads, even on Ruta 40, so the ride can be bumpy. Damaged wind shields are the norm. Most of the infrastructure (busses, flights) is there primarily to service tourists. There isn’t enough population density to support normal infrastructure. Connections are pricey and limited, even more so out of season. Along Ruta 40 the busses may run only every 2nd day and primarily during the night. If you are like me and dislike travelling during the night and for longer than 4h, bad luck. In any case, plan thoroughly. Alternatively, you can fly out of El Calafate. If it hadn't been for Cueva de los Manos I would have preferred flying to Bariloche. Interestingly, only the southern part of the park charges entry. The common way to view the southern part is to do a tour (can be bought at the bus terminal). 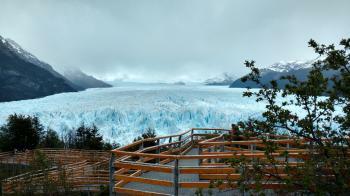 They will take you to a very elaborate view point of Perito Moreno where you can watch and hear the glacier moving from many different angles and heights. In addition, you can do a boat tour to see the glacier from up close which I skipped. Apart from viewing the glacier there aren’t many options, e.g. further trails. The action happens on the other side of the lake and this requires a boat ride and a guided tour. Be advised that things like hiking on the glacier are fairly expensive. The northern part is accessible by foot from El Chalten and free of charge. Most trails start on the edge of town. I have found that the proposed time and difficulty assigned matched more or less what I experienced. If you are in doubt, know this: If you make the initial climb and get out of the valley that the town lies in, you should be fine. You will not be able to buy provisions in the park, so pack accordingly. And finally, the northern part offers many very basic, but scenic and free camp sites. Equipment can be rented in town. I would at least plan two full days to do the main hikes. Perito Moreno is a hero of Argentine. By rerouting a river from flowing to the Pacific to the Atlantic he moved the land border to Chile in Argentine’s favour. Most descriptions of Los Glaciares National Park provide as a “signature picture” the Perito Moreno Glacier on Lago Argentino. The glacier is undoubtedly impressive and must be one of the more easily accessible major “calving” glaciers in the world. The nearby town of Calafate is served by a good airport and airline service and exists almost entirely to serve tourism with plenty of hotels, restaurants and tour agencies. As a result the Glacier is very popular with tour groups passing through quickly – It is perfectly placed for a 1 day trip with a coach journey to the glacier, plenty of easy walkways overlooking it and the opportunity for a boat ride underneath on the lake right up to it and then an afternoon or early morning fight to the next destination on a package tour of Argentina or S America. This is by no means all that Calafate and the southern part of the park has to offer - there are opportunities to visit other glaciers which are not accessible by road on the series of lakes created by “arms” of Lago Argentino. And of course one can stay in the park and camp. Los Glaciares park however covers an enormous area and we personally prefer the northern section based on the town of El Chalten - 220 kms away from Calafate on a dirt road. This town also lives by tourism but has a rather different atmosphere from Calafate – altogether “rougher” and more “frontier-like” with a high percentage of backpackers and climbers. The geography of this area meant that the rough and ready guideline for the Chile/Argentina frontier at the Pacific/Atlantic watershed was fraught with difficulties and El Chalten was created around 20 years ago to solidify Argentine claims to the area. There is another lake nearby, Lago Viedma, and this too provides glacier viewing opportunities. But it is for the mountains that most people will come to El Chalten. 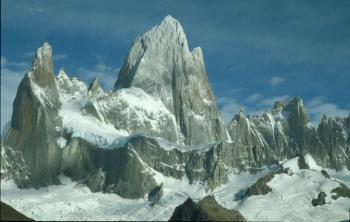 It is overlooked by Mount Fitzroy (photo), whose summit rather strangely lies just outside the Park. This provides, in my opinion, one of the most magnificent mountain sights in the world (As available to non climbers that is. I am aware that such an assertion will cause dissent but it is informed by various visits to most of the world’s mountain ranges). A few miles away lies the almost as impressive Cerro Torre (whose climbing history is mired in controversy and merits a bit of research on the web!) – Both are accessible for viewing by relatively easy paths. The weather here is highly changeable and you should give it a few days to ensure a clear day but the sight of these mountains literally “glowing” in the sun is unforgettable. Even though we were lucky in this respect we got blocked in at El Chalten for a couple of days by road closures because of heavy rain and were in danger of missing our Antarctic-bound boat from Ushuaia! Just a few further miles away the Torres del Paine range over the border in Chile (but only on Chile’s Tentative List) runs this area very close for grandeur – what a magnificent region this is for scenery! From "Los Glaciares" to "Los Glaciares National Park"
Disputed territories: At the 1981 WHC in Sydney Chile tabled a formal statement including:- "The Government of Chile will study the possibility of presenting, in the near future, for inscription in the World Heritage List, the sector of the Glaciers' Region located within its national jurisdiction". 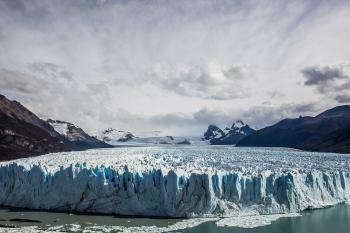 Argentina's reply included "the Argentine Delegation rejects firmly this unwarranted declaration all the more so as the whole area of the "National Park Los Glaciares" is unquestionably situated in Argentinian territory. This is the first time that Chile attempts to call in question the frontiers in that region. The "Parque Nacional Los Glaciares" was established in 1937 and, there exists an effective, peaceful and up to this day uncontested occupation by Argentina of this whole zone which belongs to it in accordance with the Treaty on frontiers signed by Argentina and Chile in 1881." In 1985 Argentina created the town of El Chalten inside the park to cement its claim/hold. Potential Transboundary sites: Chile's "Torres del Paine/Bernardo O'Higgins"
109 Community Members have visited.